A fresh take on a summery main, may look very wordy but each of the recipes are very simple! A hint of asian influence with the use of sesame oil and miso, these add in's take these cups from simple to delicious! Yet again eating with lots of colour, to get as much natural ingredients as well as essential nutrients you need to thrive all year round! These lettuce cups won't let you down.. trust me! For the Cabbage pickle, combine all ingredients into a mixing bowl, cover cabbage with liquids and massage until the cabbage begins to break down! Allow to sit in the juices for around 10-15 minutes then transfer to a sterilised jar to keep in the fridge! To make the turmeric dressing combine all ingredients into a food processor or a bullet, pulse to combine, taste to season, and if too thick add a little water! Continue to pulse to make it more creamy and delicious! Once the pumpkin is cooked, allow to cool slightly, add to a mixing bowl and simple mash through the lentils! 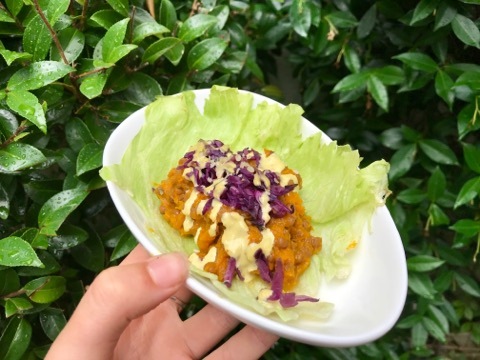 Give your lettuce a good wash, using the leaves as cups, place a small amount of the pumpkin and lentil mixture in the lettuce, top with some of your cabbage pickle as well as a drizzle of turmeric and a sprinkle of hemp seeds! Don't forget to repost your re-creations! Would love to see what you come up with.. tag @thecorehealth for your feature!